Description: SD60M 8772 leads mixed freight Q416 westbound towards Cumberland at Duffields. 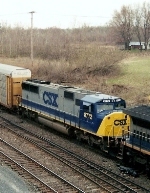 Title: CSX 8771 & CSX 8772 pulling all CSX "pigs & stacks"
Description: Sequentially numbered an unusual catch. Description: Trust me, this is a stack train. Q190 creeps along the high line on another bone chilling January day after an inch of snow has fallen. Led by bf/df emd/ge combo of former Conrail units. Description: Finally a CSX locomotive. Description: K276 power is directed by the B&O color position light signal at CP Vine to back west onto track 2 against their unit trash train. Conductor is a Mets fan who can fit right in when his train gets up to N. Jersey in a few hours. Description: CSX 8772 sitting on the Arlington Siding turned off. Description: Me standing on thr front of CSX 8772. Description: Looks like heat damage. Description: The Trailing Engine On Q190. Description: A real scorcher, this former Conrail Q SD60M has taken the heat as shown on the long hood near the CSX logo; it nonetheless leads unit trash train K277 west on the Trenton Line approaching Park Junction. Description: CSX unit trash train K206 knocks down the approach signal east at CP Belmont behind former Conrail SD60M. Description: Heading for the NYS&W connection. Description: Csx grain train passing the roanoke depot that just recently burned down. Title: NS Westbound 075 [ CSXT Detour ] @ 1628 hrs. Description: Been some time since these two former Conrail engines rode the Lehigh line west of Port Reading Jct. Description: Here's a shot of the two trains waiting just south of 71st Street. A UP freight will be approaching from the north shortly. Description: Q439 SB mixed freight, Camp Meeting Avenue, 1831 hours.